A paradise for beginners and intermediates, the Alpine village of Wengen shares the Jungfrau ski area with its neighbour Grindelwald. Take the train all the way up through the heart of the Eiger to the UNESCO World Natural Heritage site of Jungfraujoch for breath-taking views. For Beginners there are nursery slopes in Wengen and just above Grindelwald, including the blue piste at Oberjoch, a ‘slow speed zone’ (Grindelwald). Quick progress will be made with lessons from the excellent English speaking Ski Schools. 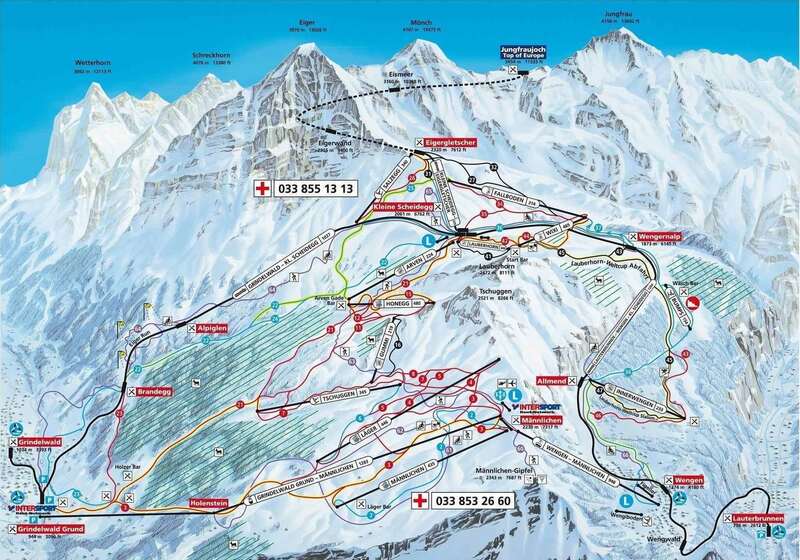 The full area Jungfrau Top Ski Region ski pass covers not only Wengen but 213kms of pistes, providing almost unlimited scope for Intermediates on a range of relaxing runs or more testing routes down the Kleine Scheidegg mountain. Highlights include the 8km run from Oberjoch down to Grindelwald and the powder slopes from the Eigergletscher to Wengernalp. Experts can try the famous Lauberhorn World Cup downhill piste, or the fearsome Black Rock run which starts at the base of the Eiger. If you can cope with any more then there is the famous black, almost vertical ‘Kanonenrohr’ in Murren. There are two half-pipes in the region, a jumpers corner in Wengen, a terrain park at Schreckfeld and excellent runs for beginners. There are 150 snow cannons contributing to the natural snowfall in Wengan and the Jungfrau ski area for more guaranteed skiing throughout the winter season. Evening entertainment in Wengen centres around the busy bars and restaurants, there is also a cinema which quite often has English language films. For non skiers there is plenty to do in Wengen and it is easy to meet friends up the mountain for lunch. Bern and Zurich are the closest international airports to Wengan transfer times between car and rail are around 2-3 hours dependant on traffic. Wengan is a car free ski resort so the last part of the journey into resort will be via rail. It&#39;s great to finish a holiday feeling young, particularly when you are 64. Before this holiday I was beginning to feel my skiing days were over - not in Wengen. I was skiing with a chap who was coming up to 80 and still getting down the slopes. Wengen seems to attract the older skier and is thus very laid back and relaxed. The slopes are uncrowded and lift queues when I went (late January) non-existent. It isn&#39;t cheap but represents good value for the discerning skier (preferably red run competent). The mountain scenery is second to none. I thought the hotel a bit noisy, however that was mostly because of the total silence of the village at night magnifying every noise in the hotel. The food was OK on the first night, when they were very busy, but steadily improved as the week went on until the sumptuous buffet on the last night. The Falken is up a steep hill and carrying skis up to the hotel is character-building, but is on the side of piste 36 so you can virtually ski to and from the hotel. I've been fortunate to have travelled to Wengen half a dozen times over the last few years. I've never found anywhere else in Europe quite as stunning... you will need a camera or a GoPro if you ski here! The ski area is vast - linked by old mountain trains to Murren and Grindlewald. Wengen has some lovely long cruisey runs, through what can only be described as &quot;Narnia-esque&quot; scenery - set underneath the Eiger, the scenery is very dramatic. The Lauberhorn run is a real thigh burner, which is in parts a lot steeper than it appears on the TV show &quot;Ski Sunday&quot; when they feature the World Cup Downhill. 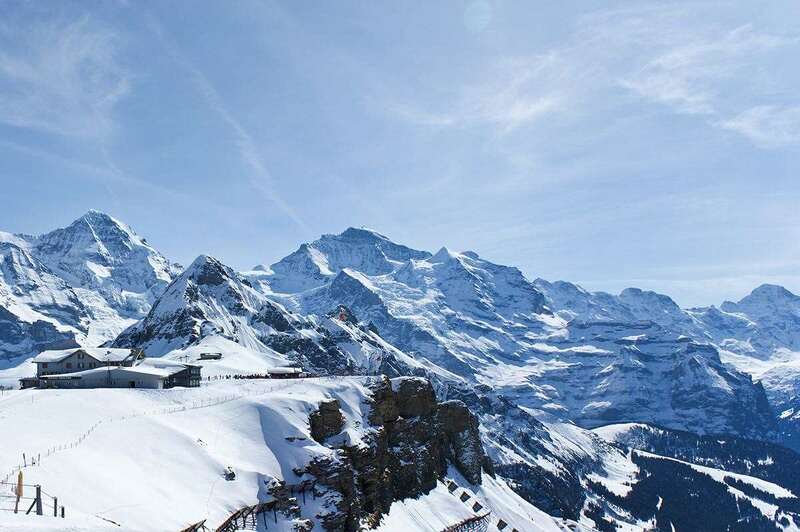 Murren has lots of potential for off-piste, with some amazing tree skiing and crazy high-alpine bowl skiing from the top of the Schilthorn. It's a secret free-ride mecca - but guides are essential. I love it here (the scenery is amazing), but I find it a little quieter than Wengen in the evenings. Grindlwald is the busier of the three resorts - but the ski area of First is great for all abilities and off-piste hounds. Again great scenery with the Jungfrau, Monch and Eiger looming in the background. Nightlife in all resorts is more on the quiet side, but there are parties to be found if you're not too shattered from a hard day's skiing. There's heaps of things to do for non-skiers - such as the Jungfraujoch (the highest train station in Europe with stunning views of the Aletsch glacier), lots of sledging (with the longest sledge run in Europe) trips to waterfalls, hiking etc. I could rabbit on and on about this area for eternity... if you fancy getting away from the masses to the big name french resorts, then you won't be disappointed!